Everyone is wearing pink. There's hot pink shirts and pale pink cowgirl boots and couples wearing bright pink, matching bandanas. There are belt buckles that are almost as pink as they are enormous, and a few pairs of rosy sunglasses. Mary Davis, event chair and co-founder of Chicks n Chaps, sponsored by Wrangler, explains to the group that, due to a mix up, the T-shirts traditionally given to event guests aren't ready yet. Someone shouts at her to save the money, to put it toward the cause, and is met with approving applause. "I was hoping ya'll would say that," Davis smiles. "This isn't really about the shirts now, is it?" It's not. The event is a fundraiser for breast cancer survivors, with proceeds going to the Arizona Oncology Foundation. Over the past two years, the foundation has used money donated by Chicks n Chaps to provide 2,885 wigs and head coverings and 555 breast prosthetics, specialty bras and camisoles to women going through or recovering from breast cancer. But it's also a hearty breakfast, a chance for survivors to share their stories, an opportunity for friends to reunite and a primer on the sport of rodeo. The Tucson edition of the event is in its fifth year, but the very first Chicks n Chaps was started was in Missoula, Montana in 2008, by a woman named Shannone Hart. Will Rassmussen, an effusive PRCA Rodeo Announcer, was there for it. "I spoke at the very first gathering of drunken females," he says. "You guys look so much more subdued and mature, but by 2 today, we'll have a look." A nearby group of women has been coming every year since the event started, forming new lasting friendships along the way. They see each other throughout the year, but this, says a woman named Sue Hornby, is what they really, really look forward to. Some know nothing, or almost nothing, about rodeo, and this is their opportunity to learn. 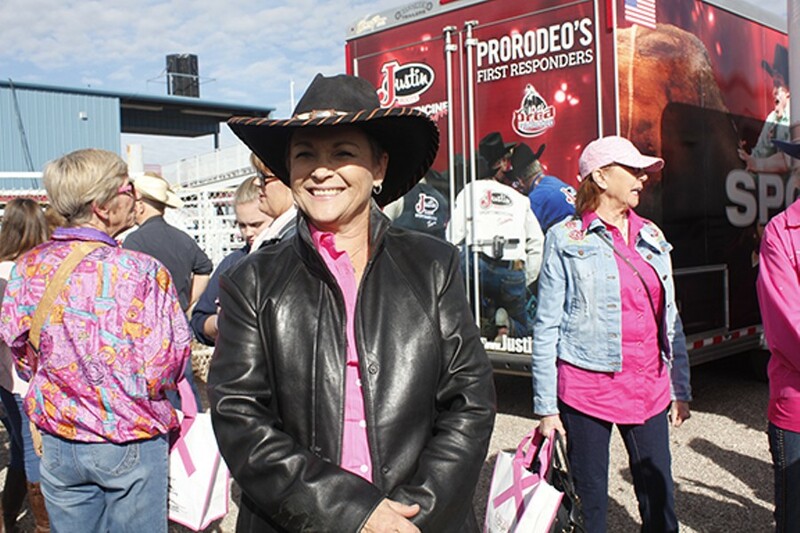 Then there are people like Kathy McFarlane, a bubbly breast cancer survivor who is an avid barrel racer herself. (For the plebs, barrel racing is the event where riders and their horses weave around three barrels, competing for the fastest time). McFarlane, who was diagnosed in late 2014, then spent 2015 undergoing treatment and 2016 recovering from the whole thing, stood up to share some of her story with the group. She's been riding horses since she was 3, "horse" was the first word she ever said, and she jokes that the money she spends on her horses is the reason she doesn't have matching towels. She admits she cried about the cancer—a total of two times in two-plus years. "I'm a tough bird," she explains. "I unloaded 10 bales of 150-pound hay yesterday, and I stacked it four high." Nadia Larsen, founder of the Nadia Strong foundation and another breast cancer survivor, also stands up to let the group know about the free photography services she offers to breast cancer patients and survivors. "I want them to feel beautiful beyond cancer," she says quietly. Becky O'Hara, director of development of the Arizona Oncology Foundation, explains that the foundation offers nonmedical services to make the cancer journey easier, for both patients and families. She shares with the group that she lost her own brother to cancer earlier this year. Even she and her close-knit group of siblings can all take advantage of resources like counseling and support groups in the days ahead. After breakfast and the talks by Becky and survivors, the day becomes more about rodeo education, and guests hear from a bull fighter about his gear, from some calf ropers about the logistics of scoring, and from McFarlane herself about her beloved sport of barrel racing. There's even a chance for guests to try out "barrel racing" themselves, by running a pinked-out, be-ribboned stick horse attached to a walker around three collapsible mesh "barrels." There's a moment where a connection between cow wranglin' and cancer gets pulled into focus when professional rodeo clown Mark Swingler is talking about the path of an angry bull. "We try to control it, but we don't always get the last say," he laughs. He's talking about rodeo sports, but, for many of the guests at the event, the sentiment rings true for life itself. At Chicks n Chaps, however, it is the survivors who get the last say, as they walk down the runway in a Boot Barn-sponsored fashion show. There's Elizabeth Almli, a physician working with cancer patients who, 12 years ago, found herself on the other end of the cancer experience. There's Pam Chess, who, after her diagnosis, dove into volunteer opportunities all over the community. There's Carole Wymer, a clinical assistant professor at the UA and a half marathon-runner, weight trainer and volunteer fitness instructor. McFarlane, too, is a reluctant model in the fashion show, smiling and laughing her way down the makeshift sidewalk runway, even though she doesn't want to, because she might as well make the best of it, right? "If you know anyone who knows cancer, who is gone through cancer, who is going through cancer, you just do it," she says. "Horses, my sport, my friends—that's what gave me the strength to come on back."